After a half-century as the University repository of printed and digital knowledge, the Vasché Library will close after spring 2019 finals to be renovated as a tech-rich space for collaboration and quiet study. The $58 million renovation is slated to be completed in summer 2021. Construction will overlap work across the Quad on the renovation of the University Student Union, a $52 million project expected to open in spring 2020. Temporary quarters for Library occupants will fill 30 modular units nestled between Bizzini Hall and Demergasso-Bava Hall, and east of the Educational Services building. The modular mini-village will rise during spring 2019 semester. A painstakingly curated 8 percent of the Library’s print materials will remain on campus throughout construction, with the vast resources of the CSU library system available through a service called CSU+ and a two-day courier service. Faculty may need to revise course syllabi and adapt library-centered assignments given the coming move-out, Rodriguez said. Online resources will help bridge the gaps for immediate needs. 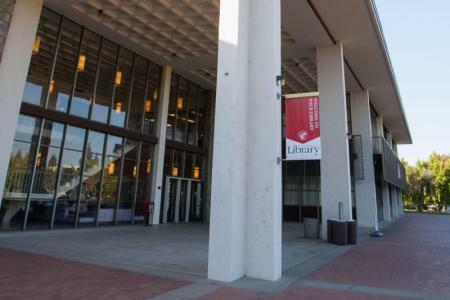 A new library website will go live early in spring semester 2019, Rodriguez said, adding that the old website will still be available to ease the transition and allow users time to learn the new website. The building’s exterior will lose its honeycombed screens — unnecessary with advances in energy efficient glass — but retain the cubist profile it debuted in 1965 as one of the first structures on campus. A 1989 expansion added footage and a third level. Decades later, infrastructure deficiencies, code upgrades and asbestos removal required throughout the 53-year-old building created an opportunity to re-envision the entire building. Feedback gathered at open campus sessions and surveys in 2017 led the design team to prioritize adding a 24-7 study area, an event center, a café, more group study rooms and quiet areas. More study seats and computer access topped the list of requests, said Associate Vice President of Capital Planning and Facilities Management Melody Maffei. Most students have laptops, she noted, but advanced projects often call for greater speed and capacity or specialized software. The University serves more than 10,000 students, only 620 of whom can be seated in the Library today. The renovated space will accommodate more than 1,000 users in a mix of quiet zones and active areas. An elevator rising all three stories tops a list of accessibility improvements and a gender-neutral restroom with full-height partitions will welcome all visitors. Downstairs, a help counter will border the lobby and the circulation desk will face the stacks. Group study tables will cluster around the ground floor café. A 100-seat event center will offer flexible performance and speaker space. Up the main staircase, visitors will walk past railings circling cutouts that allow light from clerestory windows to flood the lobby below. Beyond, banks of computer desks, tutoring services and study rooms will fill a quieter space. When the renovation is completed, services housed in the Library will return. Tech support, the Math Center, Writing Center, Academic Success Center, Disability Resource Services and the Diversity Center will have updated quarters, still under one solar-paneled roof. “It’s a great opportunity to bring student success programs that interact with one another, and library services, into a common space,” Maffei said.